New Year’s and bubbles always seem to go together perfectly, and this season was no exception. So with a lazy Saturday between Christmas and New Year Eve, it was hardly a surprise to find sparkling wines featured at every in-house tasting on our re-stocking the liquor cabinet route. How could we refuse? We’re both fans of Spanish Cavas for their ability to combine great taste with solid pricing, and the Lavit Brut Rosado we sampled first was no exception. Light strawberry in colour, this sparkler was summer in a glass – raspberries, strawberries, and just a hint of peach. Even though it was slightly over chilled for this tasting we instantly agreed it would be one to that would help solve the “what actually goes with turkey dinner” dilemma. Good for pre-dinner sipping too. The Sigura Viudas Brut Reserva that was next up is pretty much one of our standard stocker for its flexible nature and crisp taste. 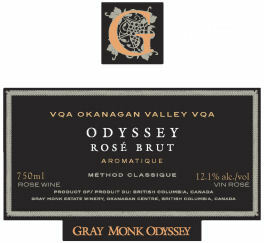 It’s also, according to Ian Farmiloe, the International Cellars rep pouring, BC’s largest selling Cava. Good for parties – especially potluck where anything is likely to show up. “So, is this one, like – you know – real champagne?” To his credit, Ian managed to keep a semi-serious expression on his face as he explained the intricacies of the Champagne region to the rather portly lady wearing a combination of tartan plaid, plenty of zestful holiday bling, and sturdy black walking boots. We weren’t quite so diplomatic and had to suddenly develop an interest in the Italian wine section several rows over. However, we did pop back for the Reserva Heredad. Perfect for when we want a bit more of a treat for less than $35, this Grand Reserve Cava has plenty of lemon-lime acidity and always makes a reliable, refreshing pour. This entry was posted in BC Sparkling Wine, Gray Monk, Sigura Viudas, Spanish Cava and tagged Champagne, Champagne France, Chardonnay, Parellada, Pinot meunier, Sparkling wine, Viura, Xarel·lo. Bookmark the permalink.